JANUARY 22, 2019 - There is a silver lining to the ominous hole in Earth’s vitally protective ozone layer, observed over Antarctica since the late 1970s: It’s not only showing signs of healing, it’s on track to fully close by midcentury. Closer to Earth’s surface, ozone is a pollutant and the main ingredient of smog. But six miles up in the stratosphere, or ozone layer, it shields the planet from harmful solar radiation. Concern over the expanding hole in the protective layer launched the Montreal Protocol in 1987, with 197 countries signing on to phase out the production of industrial chemicals that can trigger the breakdown of ozone. Scientists credit the protocol for the healing first reported above Antarctica in 2016 and, according to an executive summary recently released by the United Nations, expect the stratosphere to be fully restored by 2060. Researchers are calling the ozone’s shrinking hole slow but steady progress. 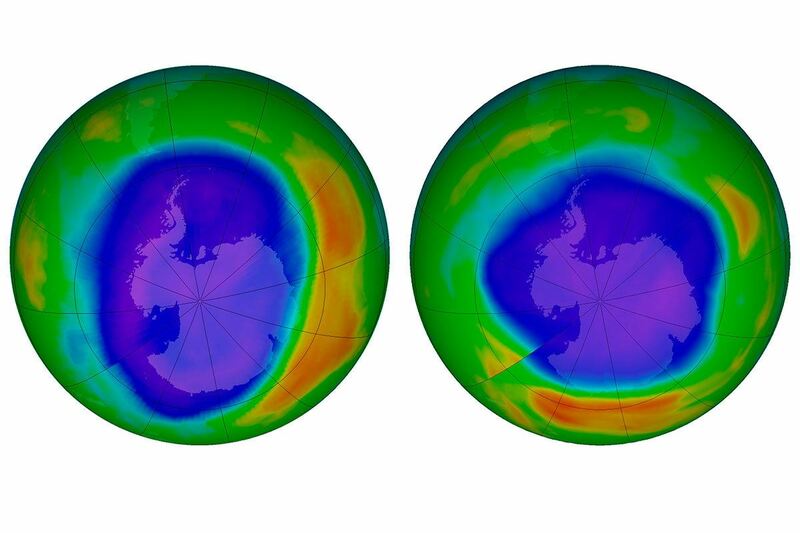 Healing the ozone layer first takes preventing those harmful chemicals from getting into the stratosphere – that’s what the Montreal Protocol was about. It targeted chlorofluorocarbons (CFCs), chemical compounds that were commonly used as refrigerants or propellants. The chlorine in the compounds can trigger chemical reactions in the stratosphere that break down ozone. But, Mr. Fahey explains, “These ozone-depleting substances ... take a very long time to get out of the atmosphere.” Even when culprits like aerosol cans have been fully phased out of production, their effects on the ozone can linger for years. In the lower layers of Earth’s atmosphere, there are already strong signs of progress: In 2016, chlorine levels in the troposphere (the lower boundary of the stratosphere) were 11 percent lower than at their peak in 1993. But ozone layer chlorine levels aren’t expected to return to the levels of 1980 until the 2040s. And in some parts of the ozone layer, the damage is so severe that it could take as many as two more decades to fully heal. Additionally, a December study published in Nature Geoscience found that emissions of chloroform could also delay ozone healing. Chloroform emissions, which are not regulated by the Montreal Protocol, could add another four to eight years to the recovery projections. If CFC-11 emissions continue to increase, they could push the general healing of the ozone layer back seven years, and the healing of the hole over Antarctica back 20 years to 2080, according to the UN summary. But steps are being taken to identify the worst offenders. And soon other ozone-depleting chemicals, hydrofluorocarbons (HFCs), will also be targeted. The Kigali Amendment to the Montreal Protocol, requiring nations to significantly decrease their production of HFCs, will go into effect for developed countries in 2019 and developing countries in 2024. This change is expected to have the added benefit of helping to reduce global temperatures. And scientists hope that the success of the Montreal Protocol will encourage policymakers to embrace other international diplomacy projects addressing climate change.